Result of Samsung Galaxy S III Melt Down - User Error Issue? Samsung Galaxy S III is indeed hot and becoming more popular each day, not only in the U.S. but worldwide but two weeks ago it was taken literally. The image below shows the controversial image which was reported to have malfunctioned while it is in an in-car holster. According to the initial report, the “hottest” smartphone sparked and flame came out followed by a “bang”. This have caused a substantial damage to the latest flagship of Samsung with a burn marks and melt down across the bottom of the device. Samsung took immediate action about this heat related issue and even posted on their official blog site that they are now investigating the problem. And to avoid any biased decision, the company hired a reputable third-party organization to investigate the reported problem. Samsung hired Fire Investigations UK (FIUK), and after 2 weeks they’ve released their official report. And guess what was the cause of this burnt Samsung Galaxy S III burnt and melted down bottom? It was definitely not caused by the mobile phone itself but an external source. 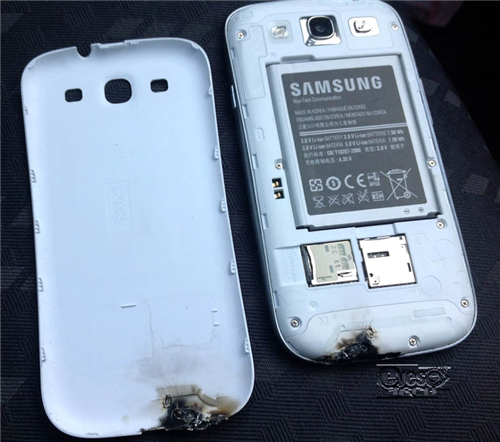 So who and what caused this burnt and damage to the Samsung Galaxy S III? According to the report released by FIUK, the Samsung Galaxy S III was intact when it was placed in the cradle (in-car holster). The burnt and damage it sustained was not caused by the smartphone but by an external source and the only way to reproduce the same scenario and damage to the phone was if either the Samsung Galaxy S III or any of its parts were placed inside a microwave. For more information about the FIUK’s investigation, check it here. A certain user with a cybername “dillo2k10” originally posted the initial report in a forum known as boards.ie. And two days ago he retracted his initial statement and said that the damage shown was NOT caused by his own Samsung Galaxy S III unit but rather by another person. He said that “another person” was trying to recover the phone from water and caused the damage to the Samsung Galaxy S III. He further admitted that there was no problem or fault to the smartphone but somekind of “stupid mistake”. I am not sure and I don’t want to be biased on the user’s original intent whether if he is “truly” testing the features and capabilities of Samsung Galaxy S III and hoping to get RMA (Return merchandise authorization) from the manufacturer. Or he just wanted the attention. I don’t want to judge him but one thing is clear now and this issue was not caused by the latest and hottest smartphone – Samsung Galaxy S III. Hey Apple, when are you going to release your iPhone 5 or whatever you may want to call it? Next Post Why Monitoring Apps Are Beneficiary for Smartphone Users? little shocking news for me..is the source true? Hello. I’m planning to buy a Samsung Galaxy Y. Before i get it can you tell me how to connect it to a wireless connection? Thanks.